Pilates Muse is a boutique studio offering premier private Pilates instruction in the Parioli neighborhood of Rome. We offer authentic Pilates training at the Pilates Muse. This means that we use the method created, as well as the apparatus built, by Joseph Pilates himself. Our state-of-the-art studio features a complete suite of top-of-the-line Gratz apparatus for the classical Pilates system. The studio has been furnished to offer quality training in a private and positive atmosphere. Our instructors have Pilates knowledge and experience to apply the system of exercises right for each client based on their body, fitness goals, and the presence of any prior injuries. All our instructors have undergone extensive and rigorous Pilates training, testing and US certification. 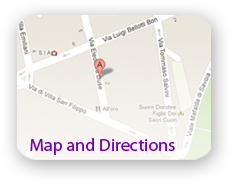 Pilates Muse is located in Parioli close to Piazza delle Muse. There is street parking and two hourly parking garages a block away on via Salvini. The 360 bus stops around the block on via di Villa San Filippo going towards Zama, and on via Salvini coming to Piazza delle Muse. Many people are familiar with Giovanni’s Gelateria Duse. Contact us today! For information and directions tel. 06/92937400, cell: 338/1096895 or email: [email protected].